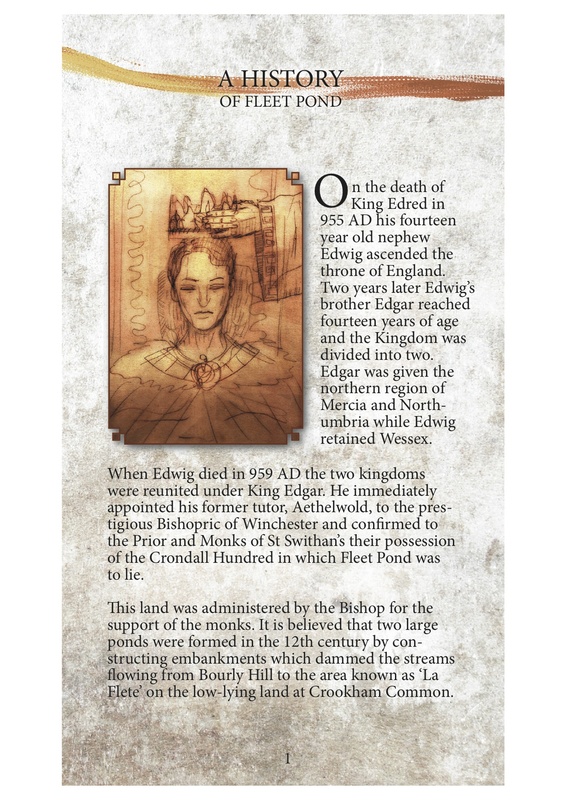 You may have previously seen the History Board at the Pond (prior to the works taking place it was near the jetty at Boathouse Corner, as above). 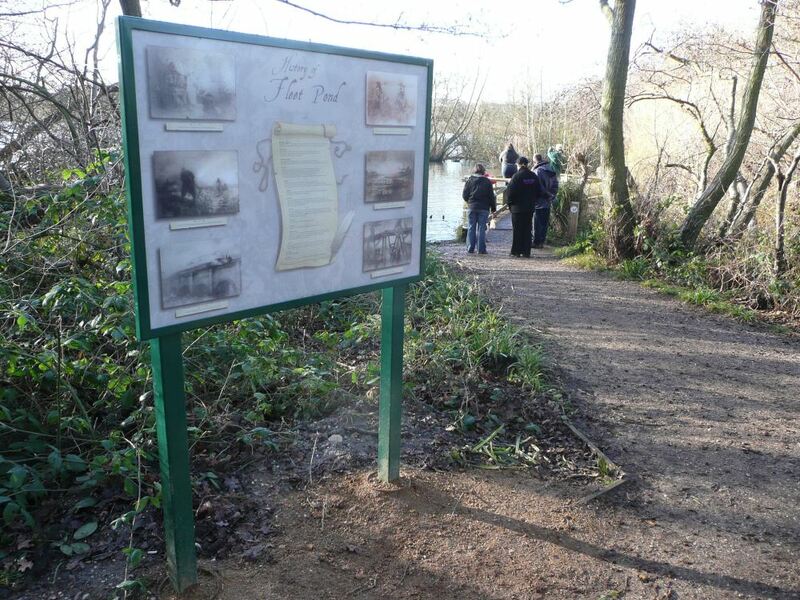 It’s been very popular with visitors and many have been surprised by the interesting stories related to Fleet Pond. Fleet Pond Society have recently produced an attractive pamphlet (sample page above) that goes into this history in a bit more detail. It’s a very interesting read and can be downloaded here (22.5 MB). The impressive artwork was produced by a local freelance illustrator, Andy Johnson. Historic Fleet Pond Facts – How Many Do You Know? Fleet Station, Fleet Pond And A Near Thing! On Sunday afternoon, whilst work progressed on the pond dipping platform, there was excitement at the nearby fishing jetty. 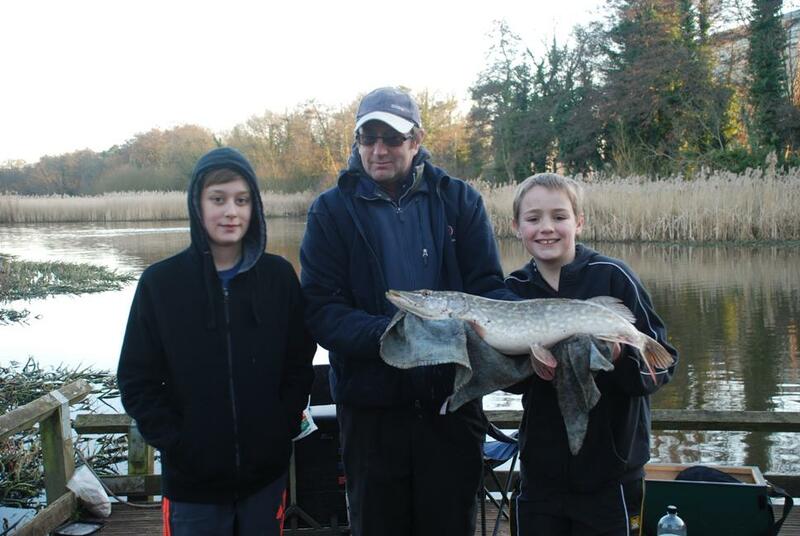 Young fisherman, Luke Martin, hauled in a whopping 7½ lb pike from the murky depths of the pond. 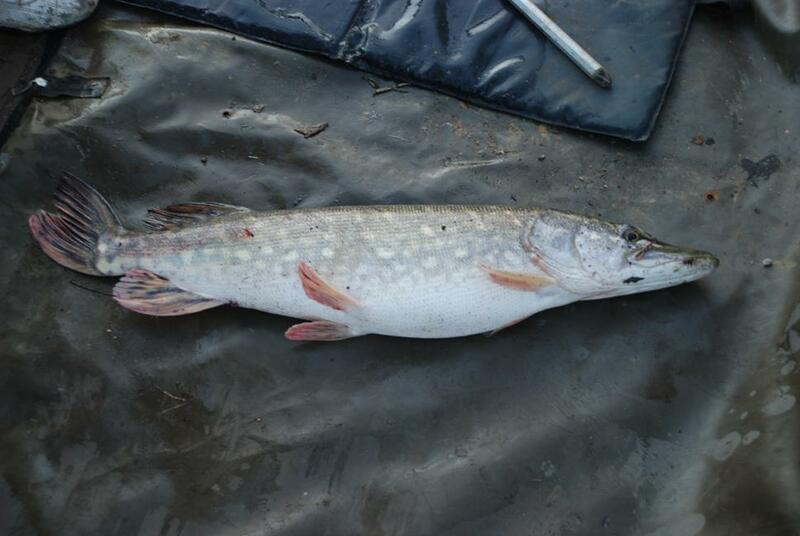 We know there are large pike in Fleet Pond, as a visit from the Fisheries Team of the Environment Agency proved – more of which can be found here. And, of course, there was also the recent sad demise of the famous one-eyed pike. Fleet Pond welcomes responsible fisherman, but asks they take care to remove any discarded fishing line from the pond. This article shows the danger fishing line poses to wildlife. “We will be joined by the 29th Odiham Scouts and the 7th Fleet Guides this Sunday, so it could be a busy morning! There are two tasks in need of attention and we might decide to break the session into two teams. 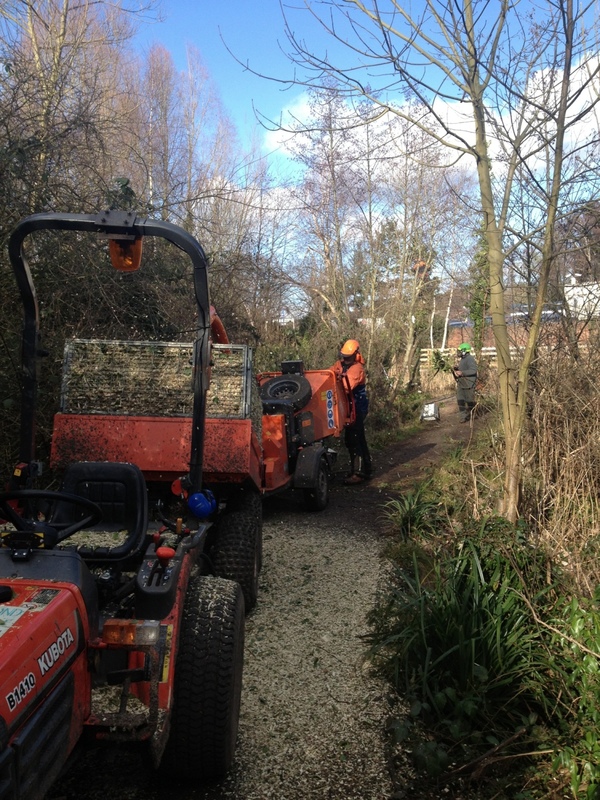 On Coldstream Marsh there remains a block of scrub to clear on the bank along the new diversion channel. Up on the Dry Heath there is more birch to clear. Both will probably need waterproof boots in view of recent rains and high water table and on Coldstream it might be best to wear wellies. Further details of meeting arrangements and related information can be found here, including the Sunday programme schedule up to June 2013. Hart in Hampshire has been named the UK’s most desirable place to live for quality of life for the second year running. The study by the Halifax bank took into account factors such as jobs, housing, health, life expectancy, crime, weather, traffic and house prices. Hart district, centred on the town of Fleet, beat previous four-time winner Elmbridge in Surrey into second place…. Hart, in the north-east corner of Hampshire, has been dubbed “a step back in time”, with 84 sq miles of green wooded landscape and the county’s largest freshwater lake, Fleet Pond. Hart District Council leader, Ken Crookes, said: “The results will come as no surprise to our residents who have long appreciated our beautiful environment, our strong economy, our high educational standards, our good health facilities and all the other things that make Hart a great place to live and work. 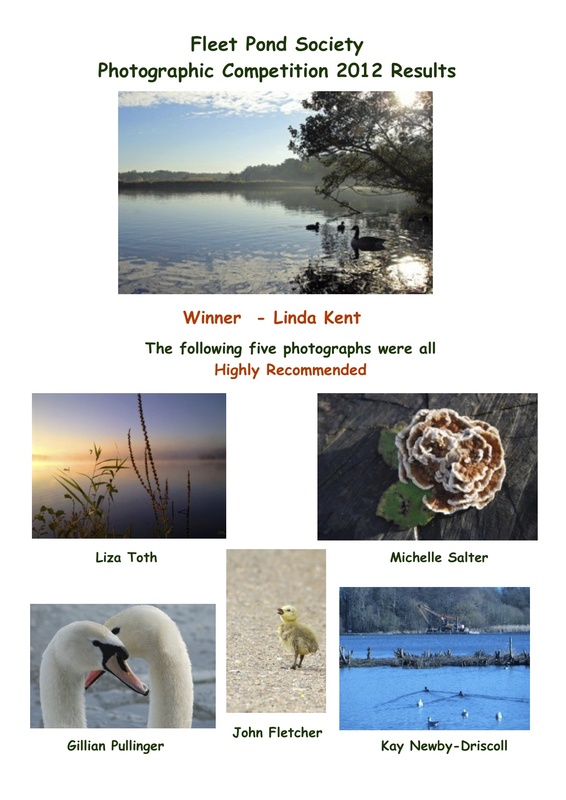 Background information on Fleet Pond Society can be found here. If you appreciate Fleet Pond and are interested in supporting our voluntary efforts, please consider joining – it’s just £10 a year! Fleet Pond Society is a member of the Blackwater Valley Countryside Partnership and here’s some information on a walk the Blackwater Valley Countryside Trust are organising for April. Please support them if you can. “Get out your walking boots and come along to walk the lower reaches of the Blackwater Valley Path on Sunday 28th April 2013. 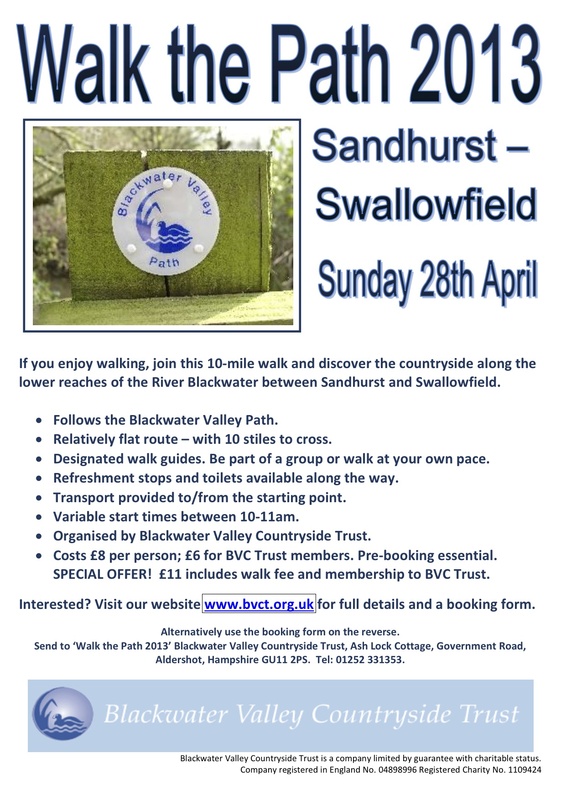 After a year’s absence the ever popular ‘Walk the Path’ event returns, as a one day walk covering the last 17 km (10 miles) of the Blackwater Valley Path from Sandhurst to Swallowfield. This beautiful part of the Blackwater Valley passes through some peaceful rural areas and if you’ve never explored the countryside here before this is a perfect opportunity to do so as part of an organised walk. As in previous years participants can walk at their own pace or be part of a group as there will be designated walk guides. There will be transport at the start/finish to take you back to your starting point, refreshments stops and toilets en-route and a collection service if you are unable to finish the walk for whatever reason. You are currently browsing the Fleet Pond Blog blog archives for February, 2013.